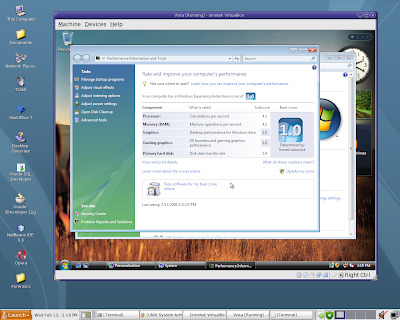 While qemu + kqemu was sufficient for most tasks on Solaris hosts, VirtualBox tends to be faster and simpler to use. You get mouse integration, seamless mode, snapshots, shared clipboard and folders, Alt-Tabbing to Windows apps... Virtualbox has it all. solaris% ldd * | grep "not found"
Problem 1: the VBox.sh script relies on /bin/bash, change to /usr/bin/bash or /usr/bin/ksh. Easy fix :-). We download it from Nexenta! 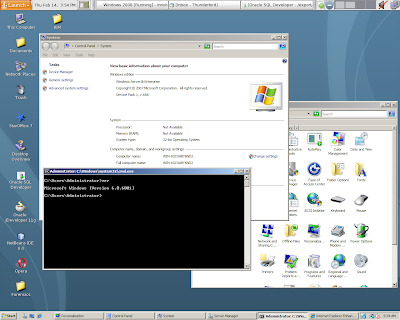 Now we can start VirtualBox and run Vista on Solaris using virtualization :-). If you want sound, install OSS. As you can see, apart from the poor graphical performance (as expected from Virtualization software), performance is very good. Especially disk I/O. And for all the people who wish to convert their VMware and QEmu virtual machines to Solaris / VirtualBox, read this. Expect a FreeBSD version of VirtualBox soon. 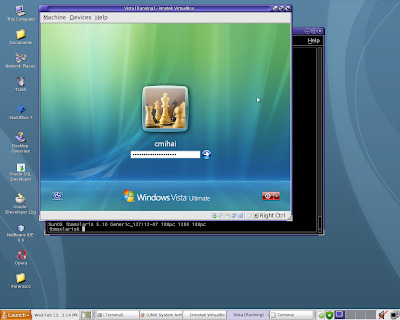 If you want VirtualBox Guest Additions, just download a debian package or whatever, and use ar -x to unpack it. Grab the ISO and mount it in the virtual machine. 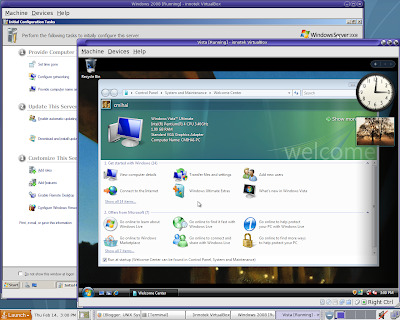 You need them for AMD PCNet drivers (networking) on Vista and 2008 for example. Want to have some fun? Use VirtualBox virtual machines on ZFS with compression and snapshots :-). You'll get at least 1.5x compression with virtually no performance hit (less data to transfer == faster with a minor hit on CPU for compression / decompression). 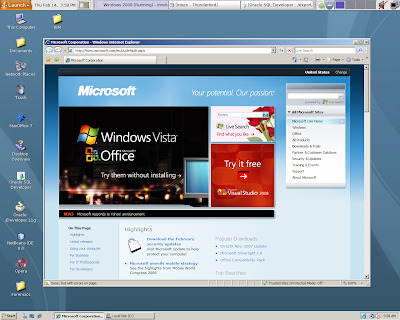 Note: VirtualBox also released a 32 bit package for 32 bit x86 Solaris systems. 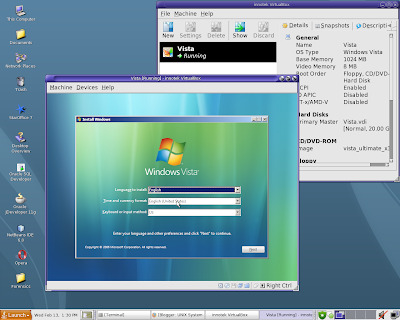 What computer did you run Vista on VirtualBox ? How many Ram and how does it feel ? It's quite responsive. As you can see, it gets pretty good scores, pretty close to what you'd get on real hardware (except for the video card, of course). Machine is an simple IBM Intellistation, single core 3.4Ghz CPU, 4GB DDR-2 and 4 disks in RAID-10. Wow, quite a machine. It had to run responsive. As a small quirk for VirtualBox, on linux it doesn't support tickless-kernel which I use on my laptop. Performance is on par with VMware workstation from the benchmarks I've performed. You can use the tools I've posted to convert VMware machines to VirtualBox (or just restore a regular full system backup). Either way, it's much much faster than qemu + kqemu, and it's lighter than VMware server. And it's free. Plus it runs on MacOS, Solaris, Linux, Windows and soon FreeBSD hosts. It also supports VTx extensions and has client additions (like VMware has VMware tools). I think it's the only one with Seamless Mode. Does it work on Solaris ? Any ideea on how KVM is performing ? Ubuntu chose KVM in Hardy instead of Xen as Fedora/RH. 2. Use Solaris containers (zones). A freebsd version would indeed be nice. I tried virtualbox about a year ago, and back then it couldn't run for 5 minutes witout crashing the gues OS. If it really does work now, there's still crappy network support, it only supports nat and port forwarding, not bridge or stuff like that. If you're familiar with development tools, give it a try. As you can see piku, seamless mode works perfectly :-). Very responsive also. The FreeBSD build instructions are being worked on as the FreeBSD port advances. If you like to help out with the FreeBSD port, please join the #vbox-dev irc channel or drop a mail on the development mailing list. I have add /usr/openwin/lib to LD_PATH_LIBRARY but it didn't help. I get the same problem with fully-patched Solaris 10U4 and amd64. It seems that the build was actually done on OpenSolaris. I also encountered the problem with failing to find the necessary X11 libraries on fully-patched Solaris 10U4. I encountered the Unable to load R3 module /opt/VirtualBox/VBoxDD error message as well. It seems that the amd64 build is actually done under OpenSolaris and not Solaris 10. 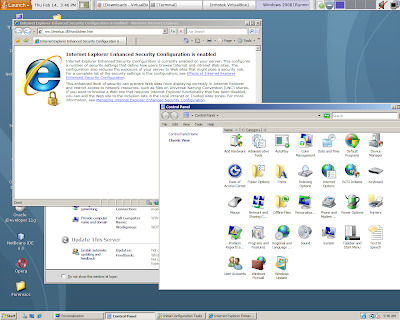 Can you get WinXP Pro via VirtualBox on a SunBlade 100 with Solaris 5.9 on it? Multumesc. Won't work using VirtualBox (para)virtualization. 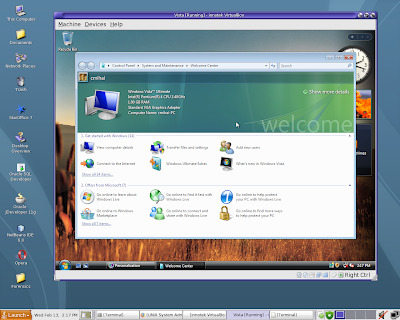 VirtualBox requires a x86 host and guest (AMD64 is also x86, btw). SunBlade 100 is a SPARC based machine, so you'd have to use an emulator like qemu-x86. While that would work, it will be quite slow. I was wondering if it's possible to run any VirtualBox VM while Solaris is booting? If you mean start virtual machines at host machine startup, sure. VirtualBox uses a client/server architecture so all GUI commands are available via the API and the command line tools (VBoxManage) so it's easy to script. It's up to you if you want to use the old fashion init or create SMF scripts for individual (or all) virtual machines. Is there a way to install VirtualBox as a non-root user? I use a Sun Ray at work and don't have root access. Thanks. While you can and should use VirtualBox as a non-root user you'll need root access to install the package (or if used from a tarball setup vboxusers user groups, device permissions, and so on). You could also try qemu. 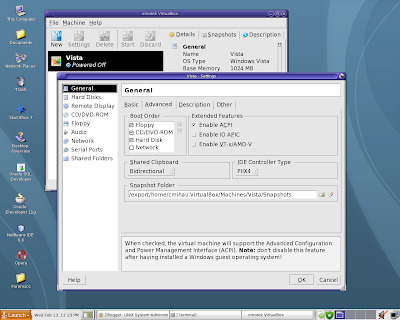 VirtualBox is available as a standard Solaris package. Download the VirtualBox SunOS package which includes both the 32-bit and 64-bit versions of VirtualBox. The installation must be performed as root and from the global zone as the VirtualBox installer loads kernel drivers which cannot be done from non-global zones.